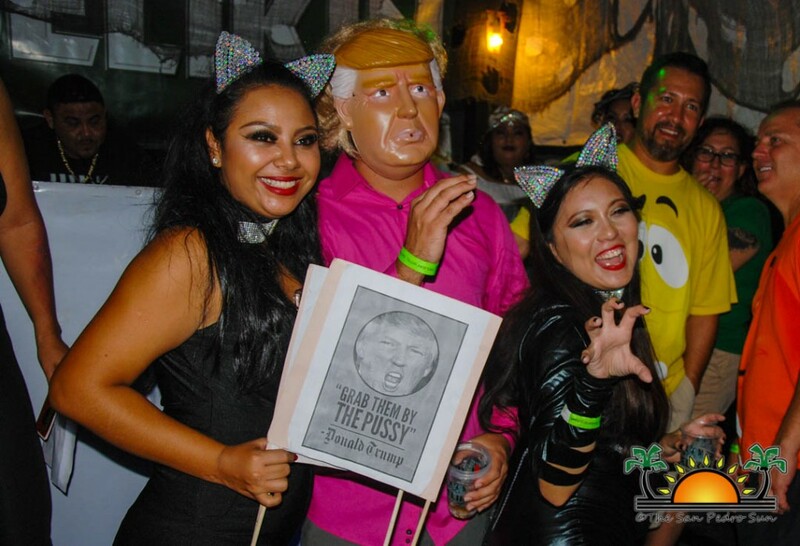 An eager crowd of onlookers gathered near the traditional green carpet, curious and excited to see what the different costumes the evening would bring. 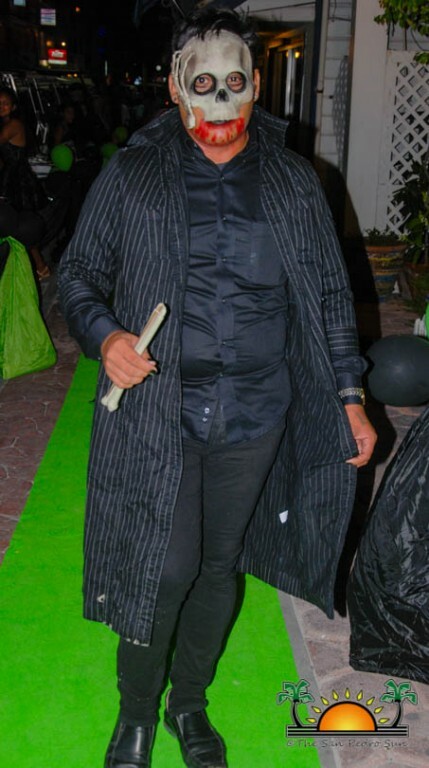 Shortly after 9PM, the first participants began arriving, sashaying down the carpet to a captive audience, who cheered and the flashed their cameras. 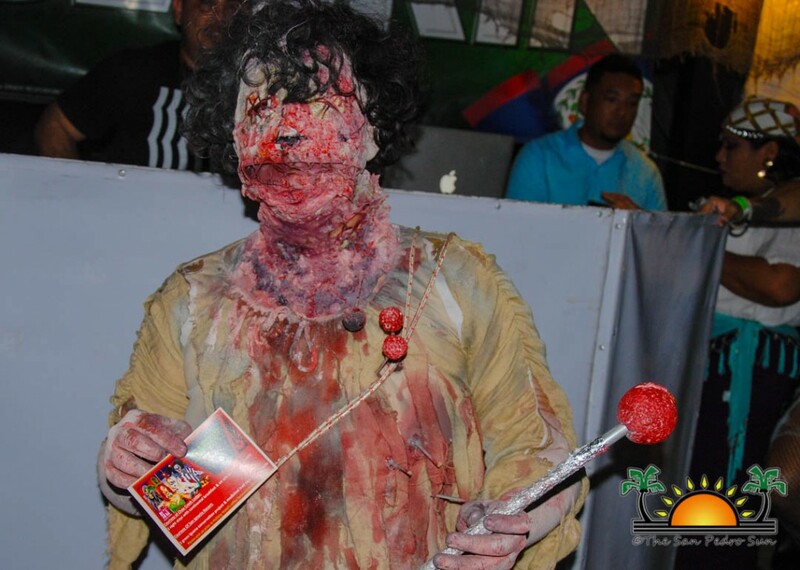 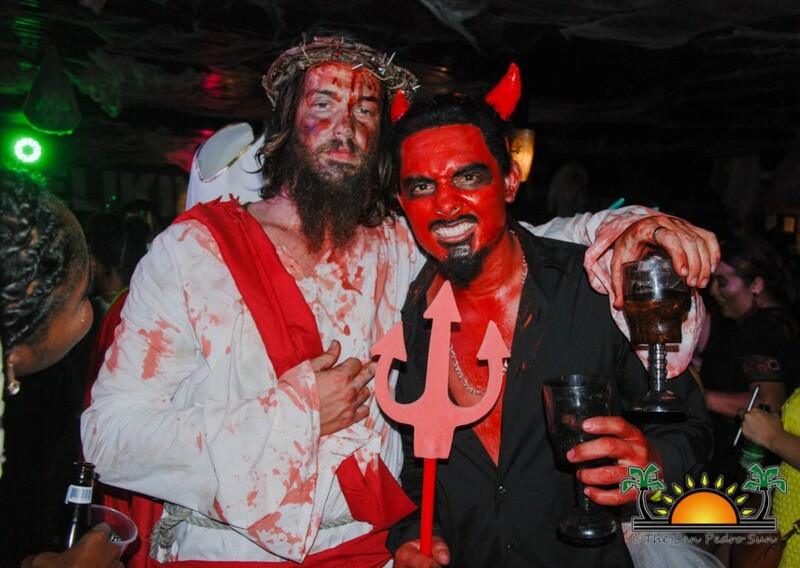 Pirates, clowns, witches, super heroes, demons, mummies and even religious figures made their way inside. 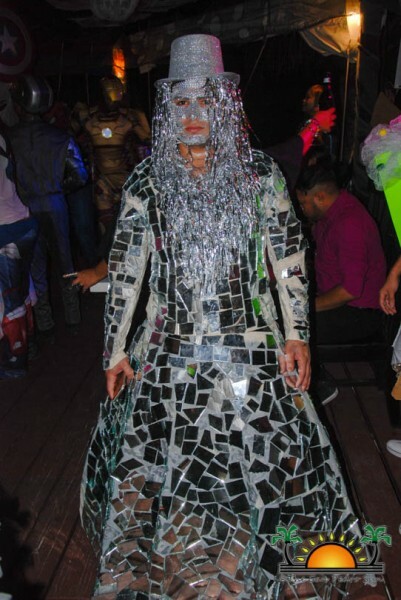 One eye-catching costume featuring broken pieces of mirror had the crowd murmuring. 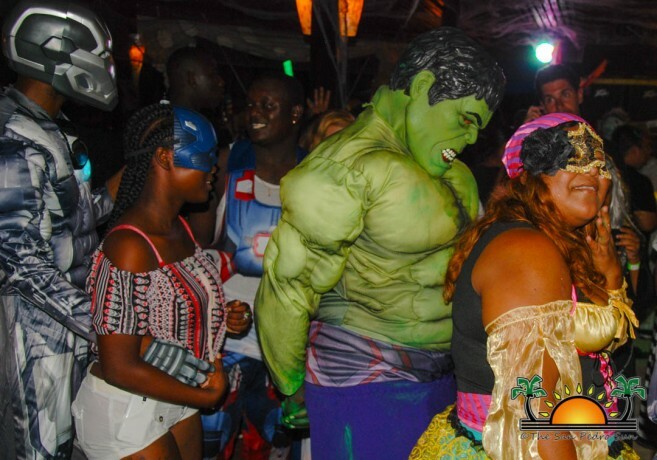 On the dance floor, the different characters danced the evening away to DJ Karlo’s fun party mix. 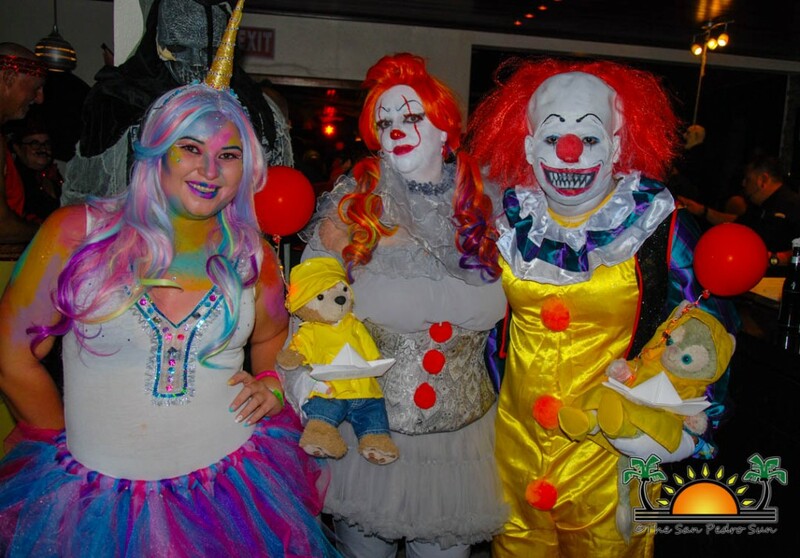 Every now and then, a new entourage of characters would join the party, and judges Monique Smith, Mynor Tepaz and Wilfredo Alamilla Jr. had their hands full determining who the winners would be. 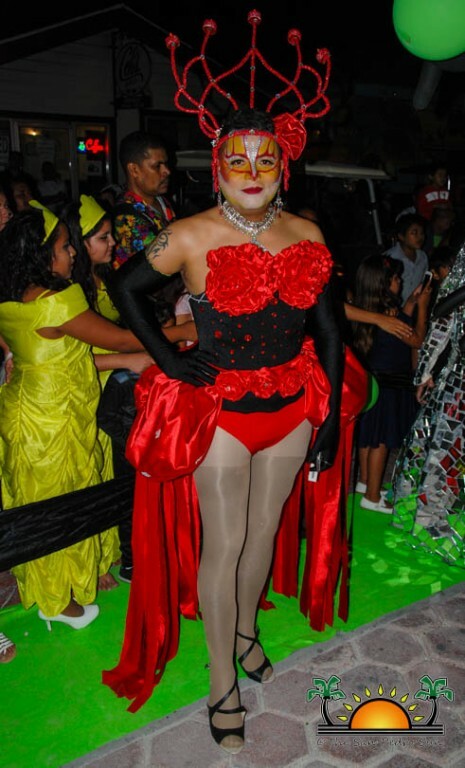 Master of Ceremonies Eiden Salazar kept encouraging participants to pose for judging, as there were thousands of dollars in cash and prizes to give away. 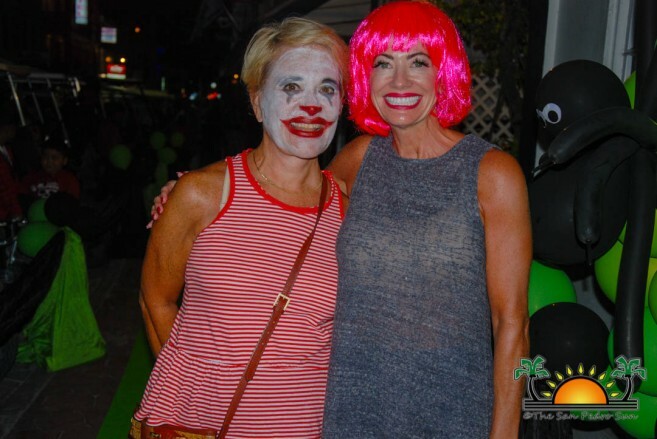 Just before the grand announcement, a duo of professional dancers entertained the crowd with a dance number. 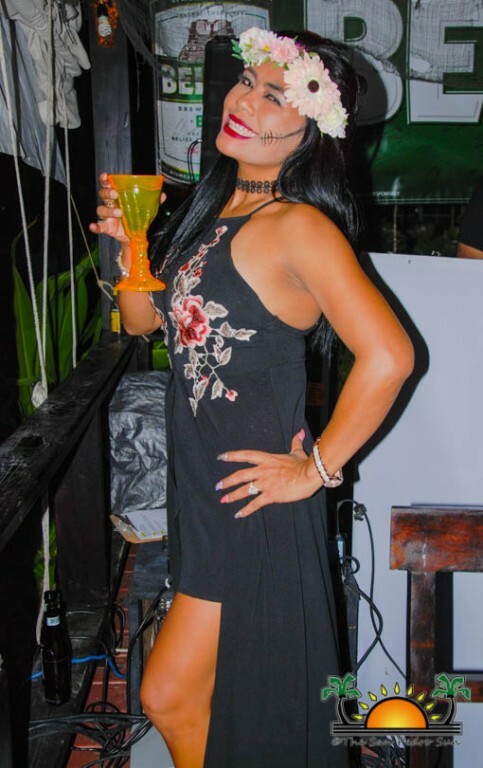 After their performance, manager Lisa McCorkle Guerrero congratulated and thanked everyone for making Holiday Hotel’s bash another one to remember. 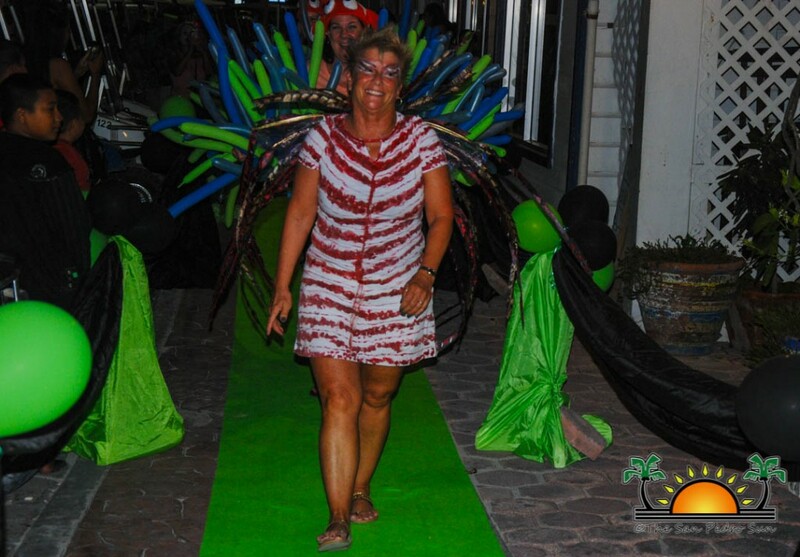 In her hands was a list of winners, and the crowd held its breath in anticipation. 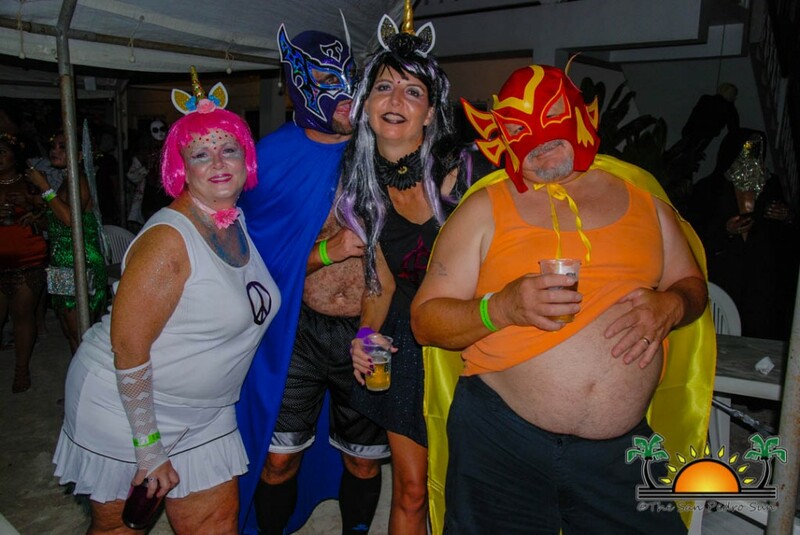 Best Make up went to Delsie the Unicorn, and she won one case of Belikin Beer courtesy of Bowen and Bowen and one bottle of rum courtesy of Travelers Liquors. 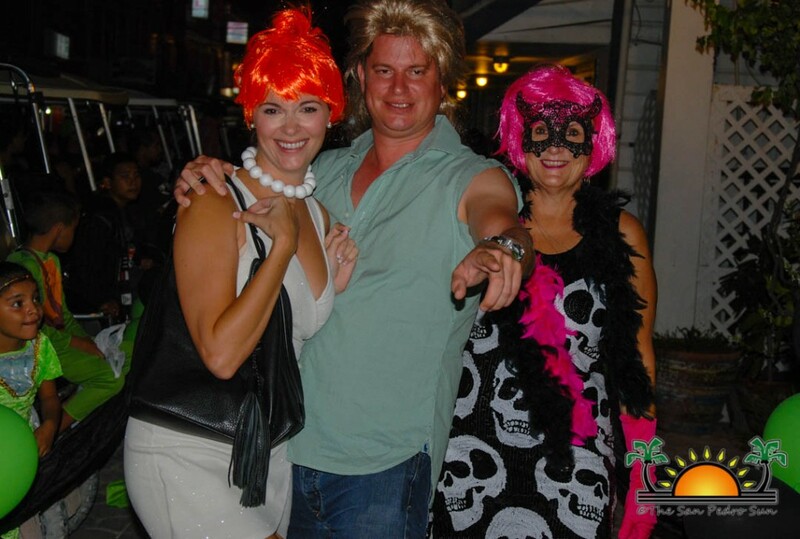 The prize for Cutest went to Eileen the Peacock, and she took home a $100 gift certificate wine and courtesy of Wine De Vine. 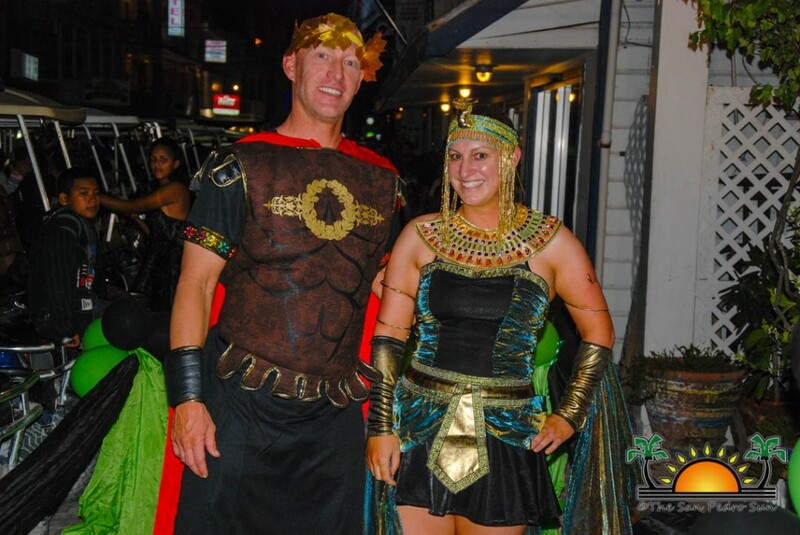 The Manager’s Favorite went to ‘Finding Nemo,’ who walked away with $100 gift certificate courtesy of Caprice Bar and Grill and a three- month membership to Train Station Fitness Club. 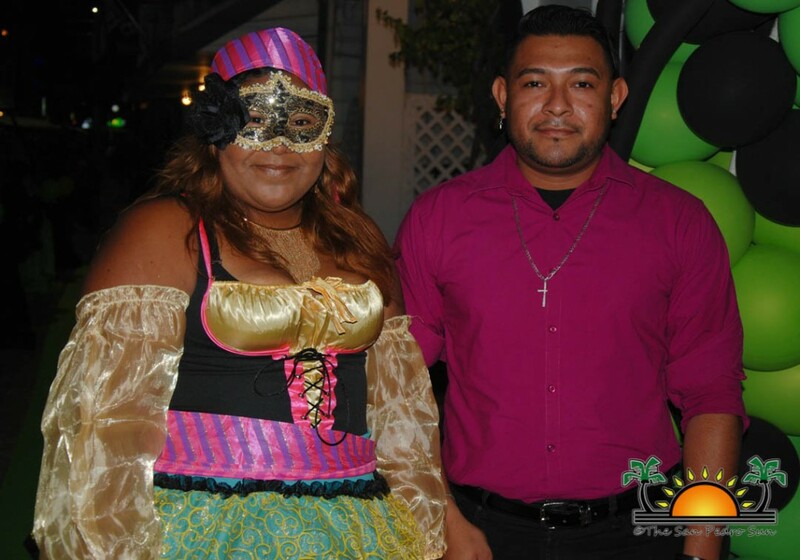 The Wildest went to M & M’s, who took home two bottles of rum courtesy of Traveller’s Belizean Rum. In the Best Couple competition, two prizes were awarded. 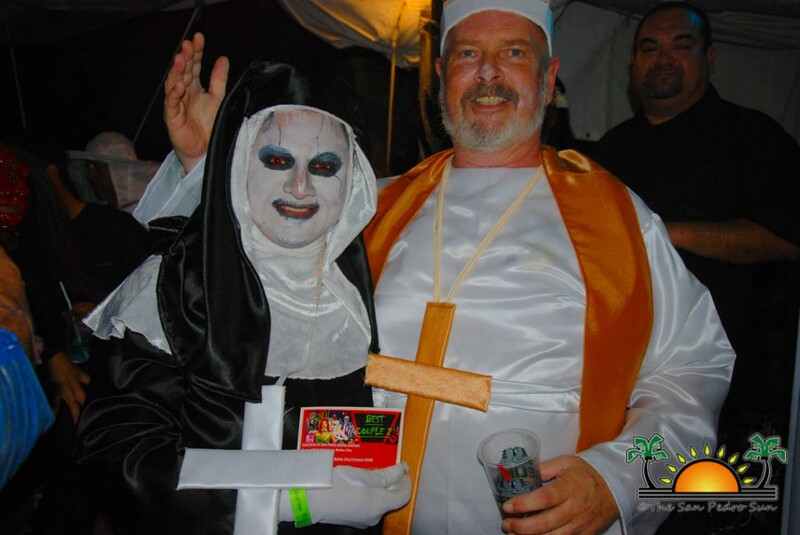 Best couple number two went to Priest and Nun, who won $100 certificate courtesy of Castillo’s Hardware. 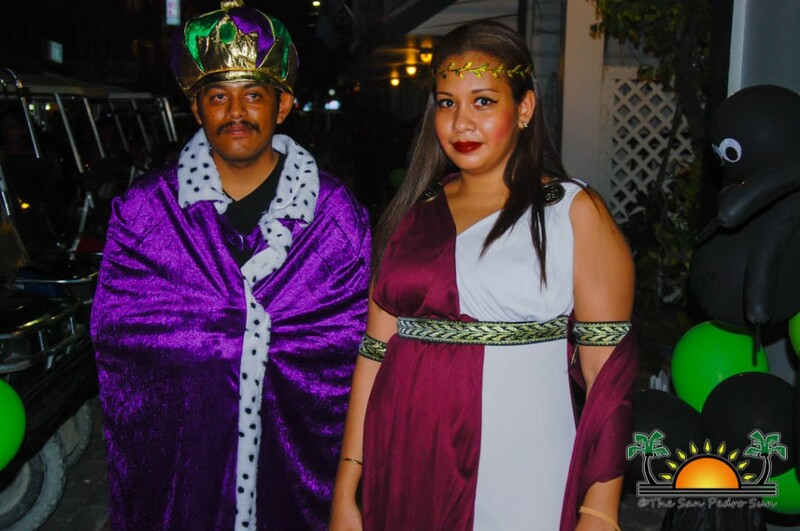 While, Best Couple number one was for Games of Thrones, who walked away with a $100 gift certificate courtesy of Graniel’s Dreamland, and one gift box courtesy of Cuello’s Distillery. The Least Recognizable went to the Wicked Grandma, who took home two round trip tickets to Caye Caulker courtesy of San Pedro Belize Express, and one gift box courtesy of Cuello’s Distillery. 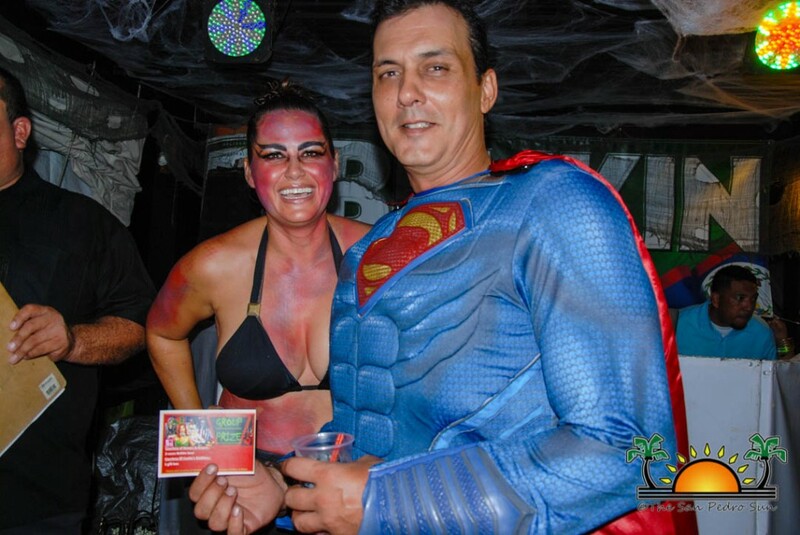 Taking home the title for Best Group was Justice League, who won two cases of Belikin courtesy of Bowen and Bowen and one gift box courtesy of Cuello’s Distillery. 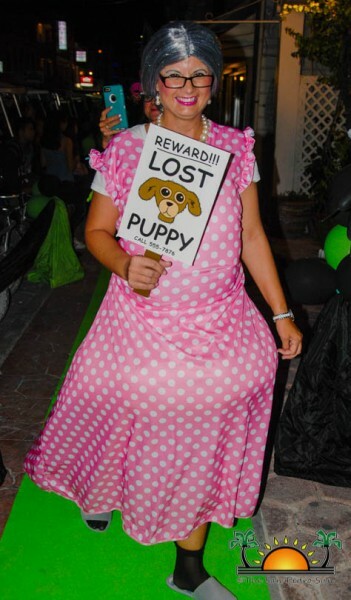 The Funniest award went to ‘Lost Puppy Sabrina’ who walked away with a $100 gift certificate courtesy of Rain Restaurant. 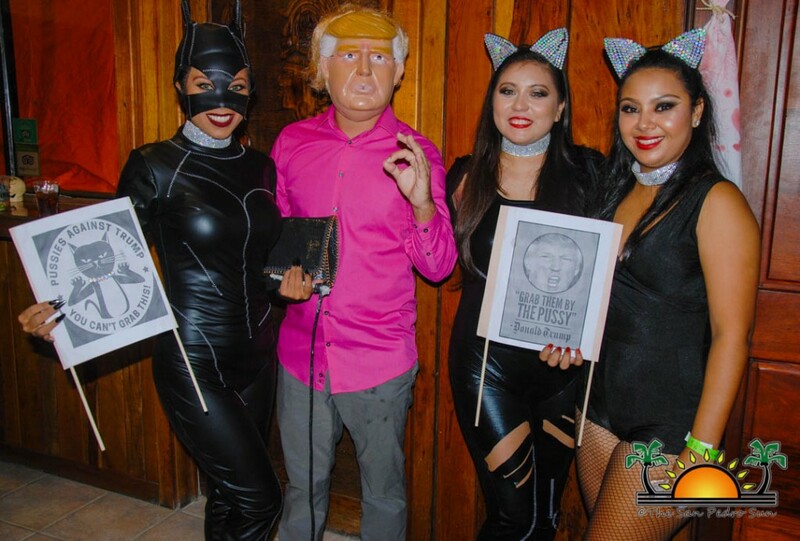 The Sexiest award went to ‘Trump and the Pussies,’ and they won $150 gift certificate courtesy of Wings. 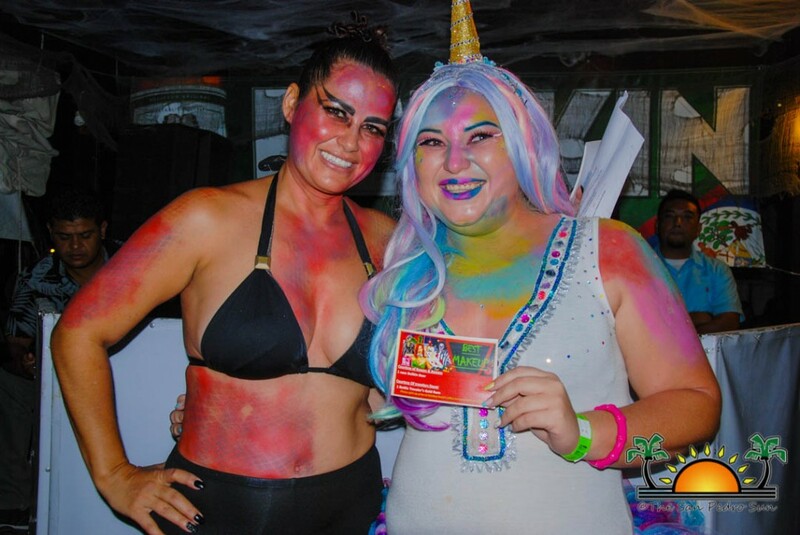 Most Elegant went to ‘Golden Mermaid Selena,’ and she took a $100 gift certificate from Foreva Fancy Boutique and a $50 gift certificate from Blue Water Grill. The Creepiest went to the ‘It’ clowns (Erin and Ottmar), who won a $100 gift certificate courtesy of Evoo Euro Bistro and a $75 gift certificate from Premium Wines and Spirits. 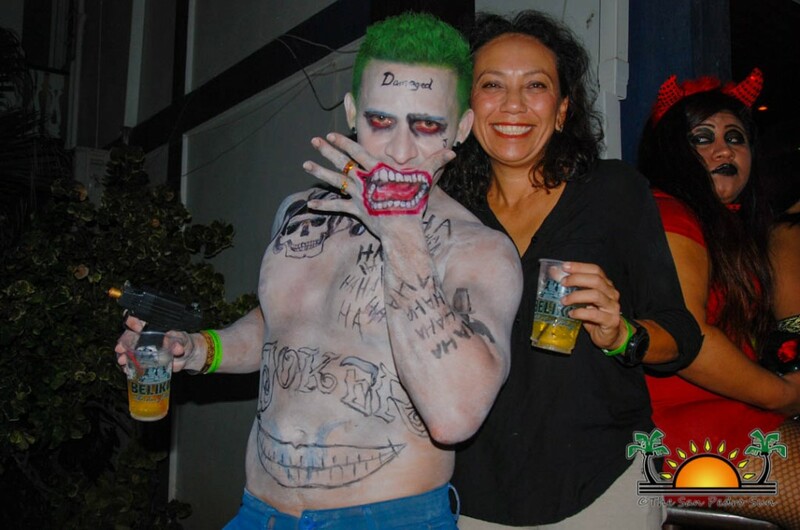 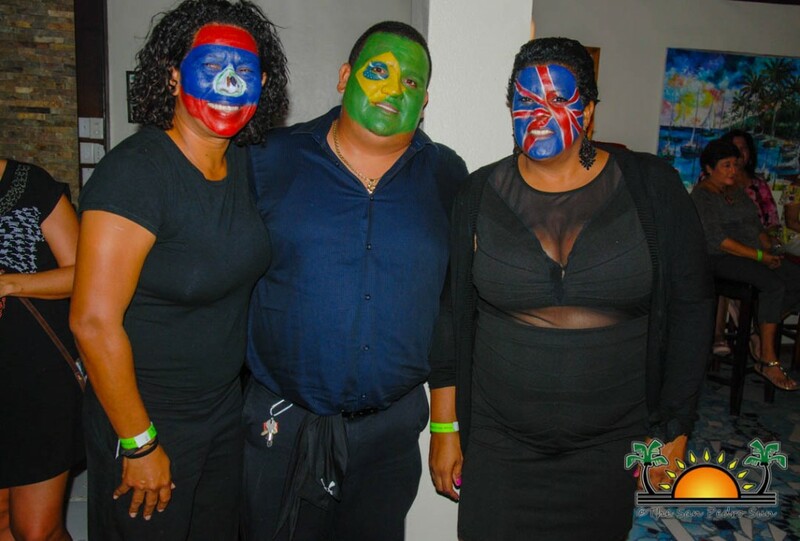 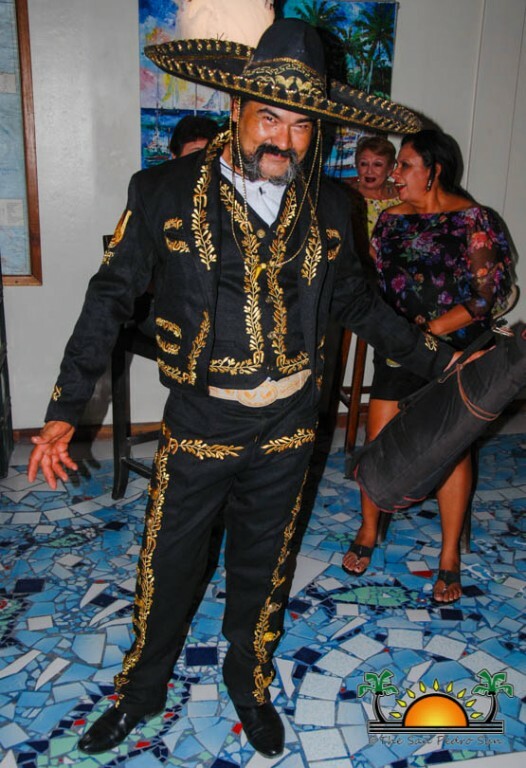 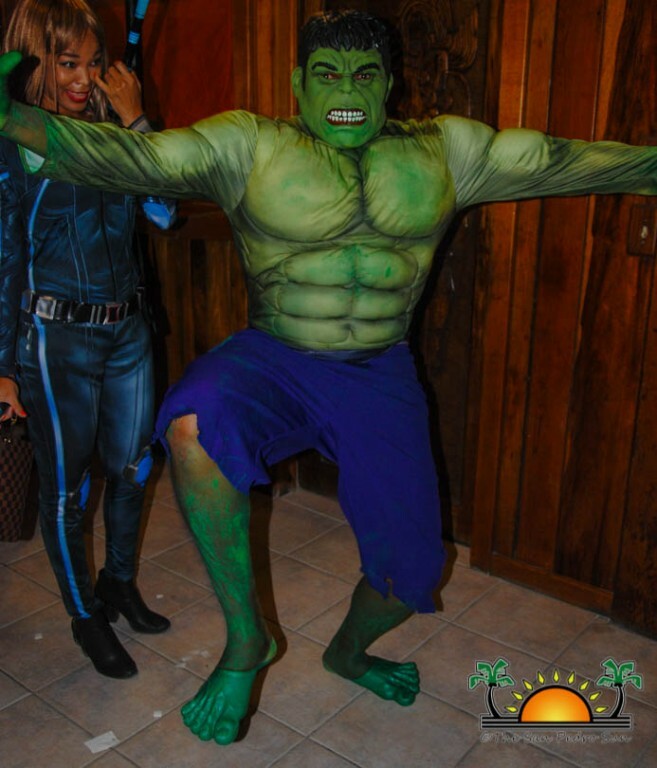 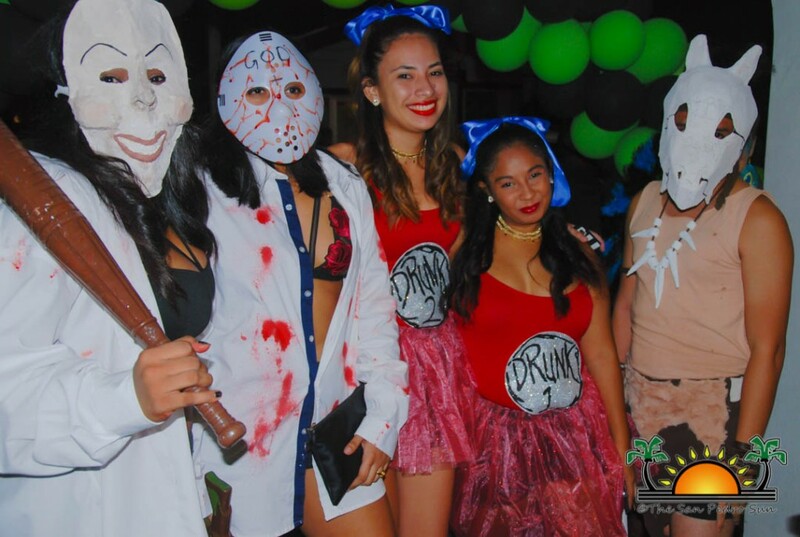 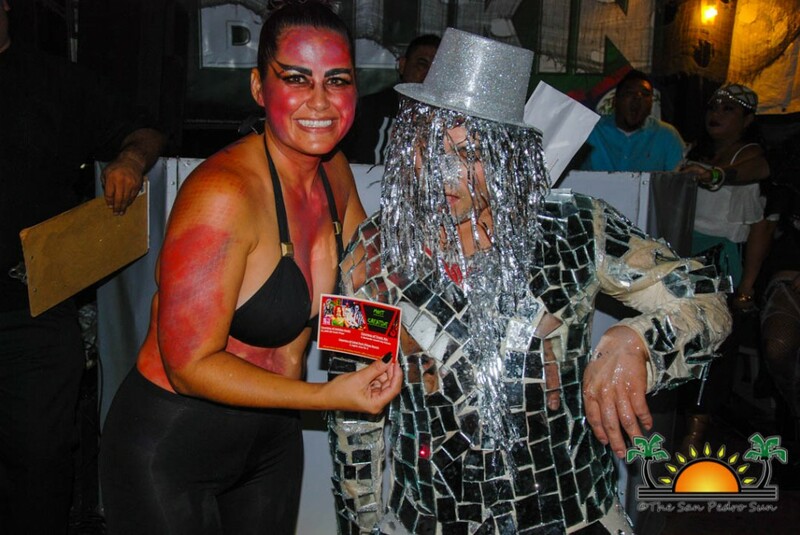 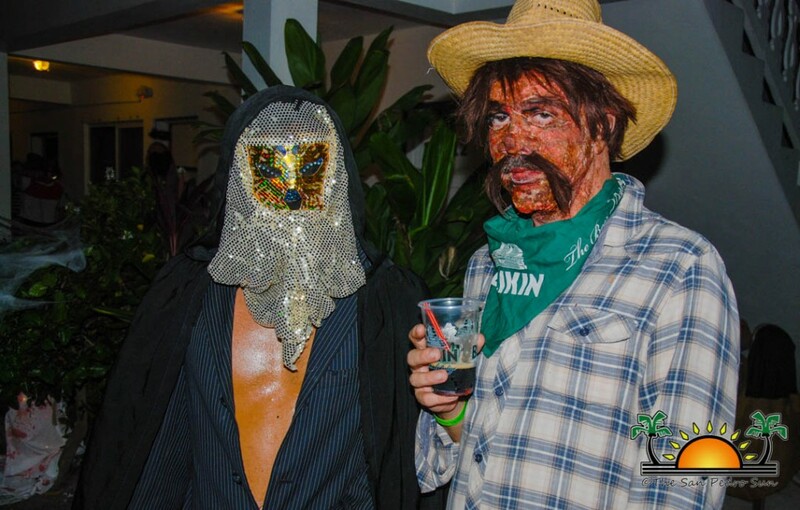 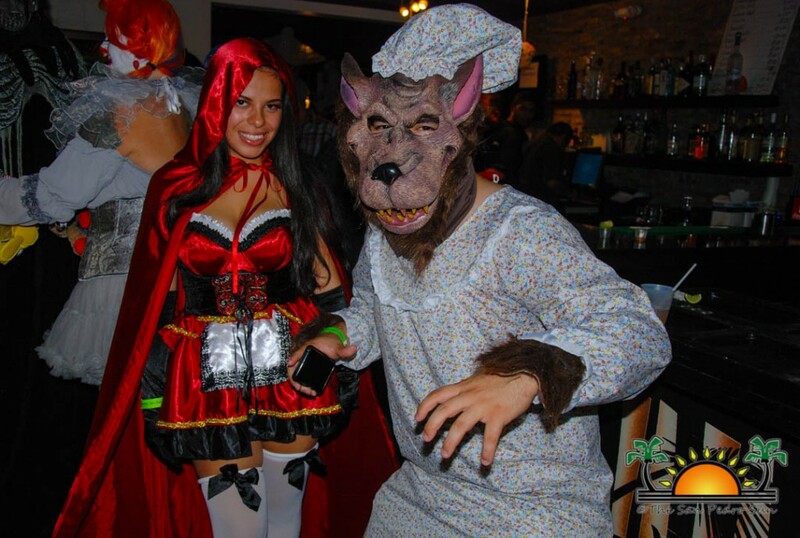 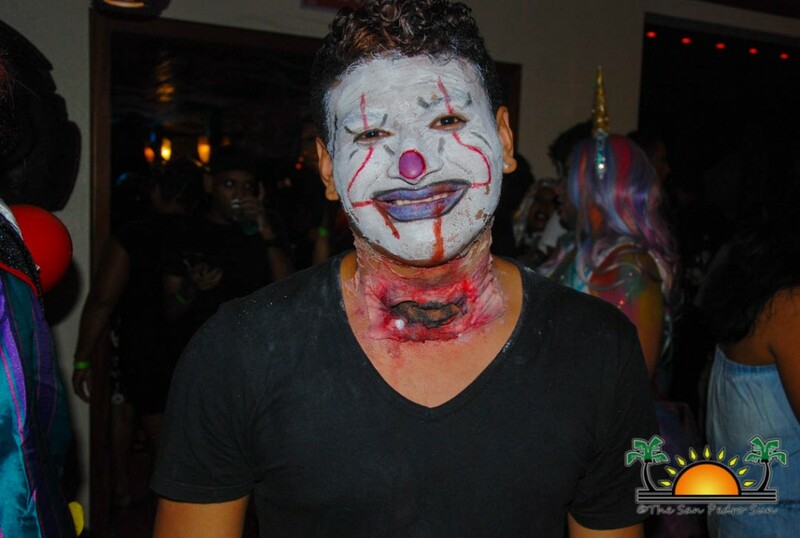 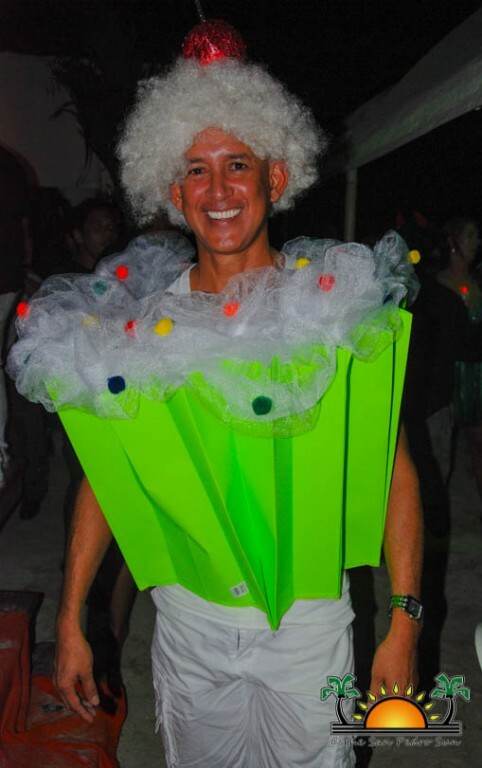 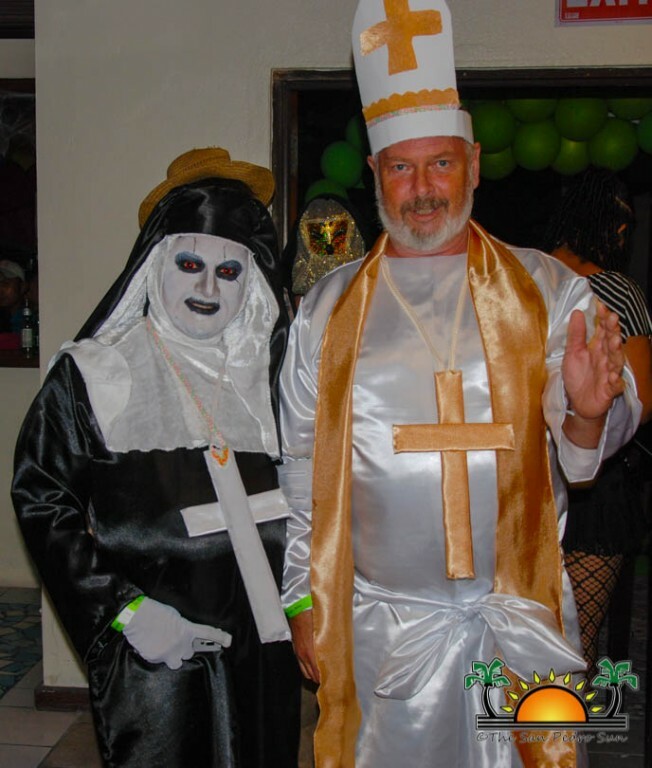 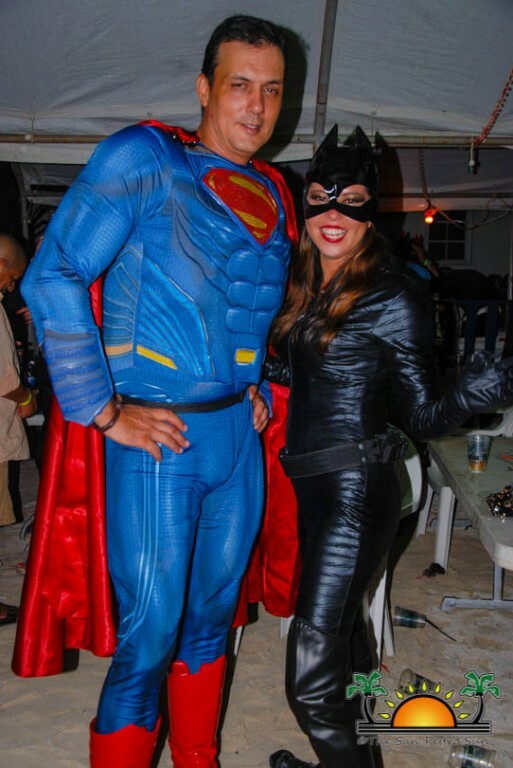 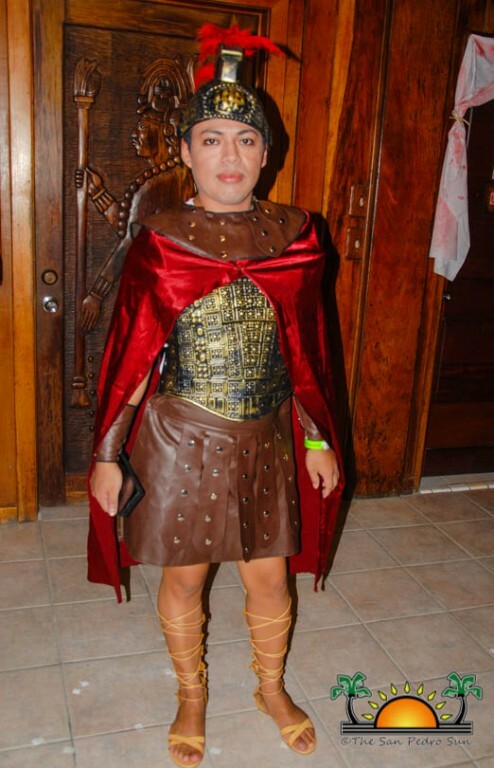 Most Spectacular was the ‘One Night Stand’ costume, by Leonel Milan, and he won two roundtrip tickets to Belize City courtesy of San Pedro Belize Express and one night stay at Ramada Belize City Princess Hotel. 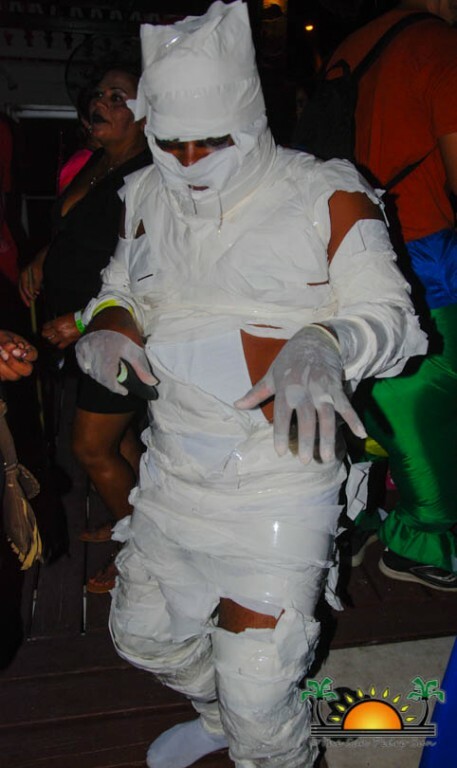 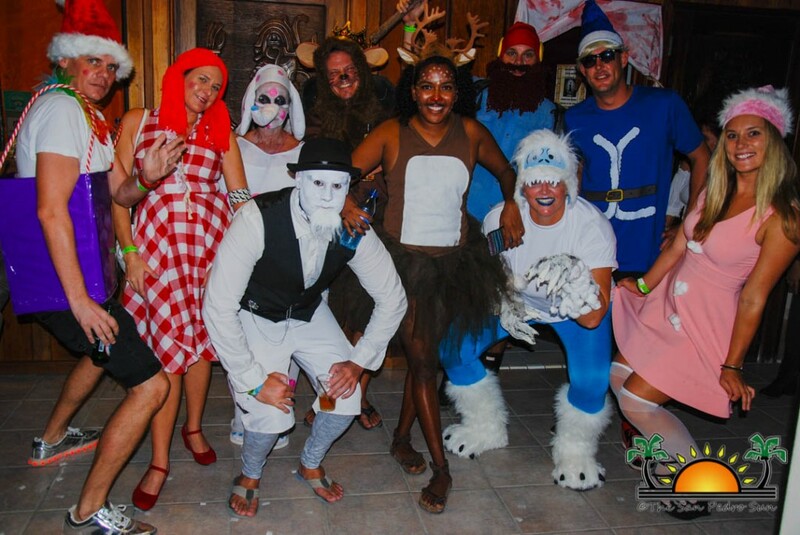 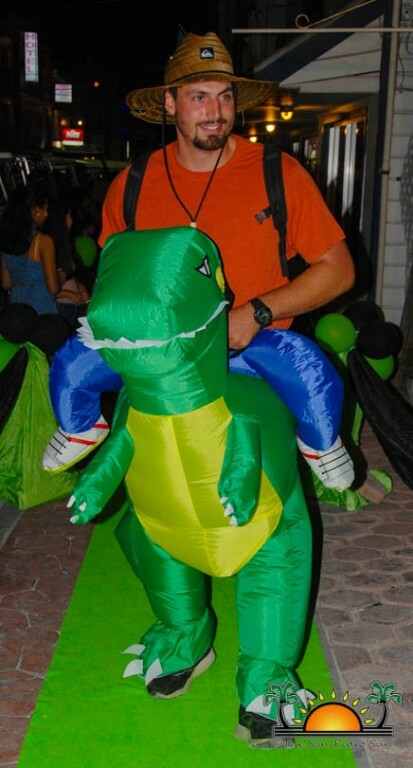 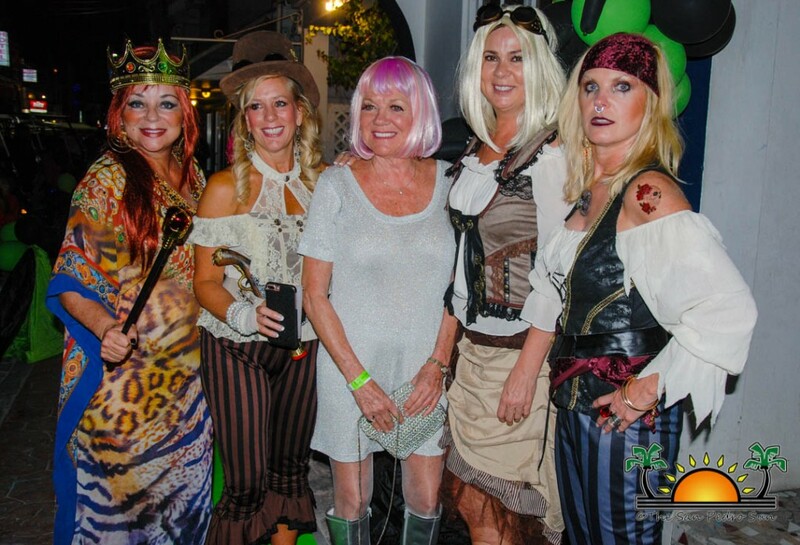 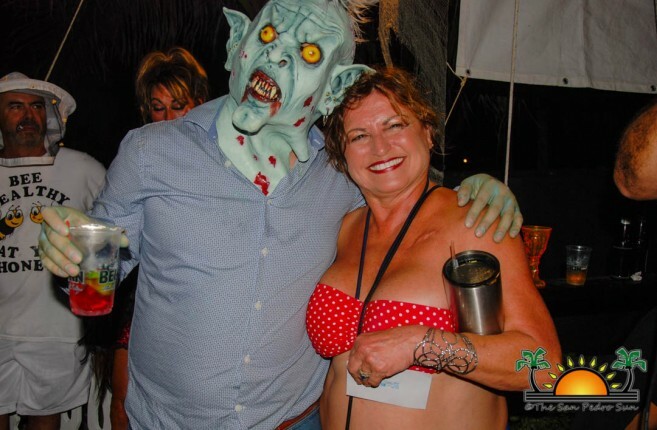 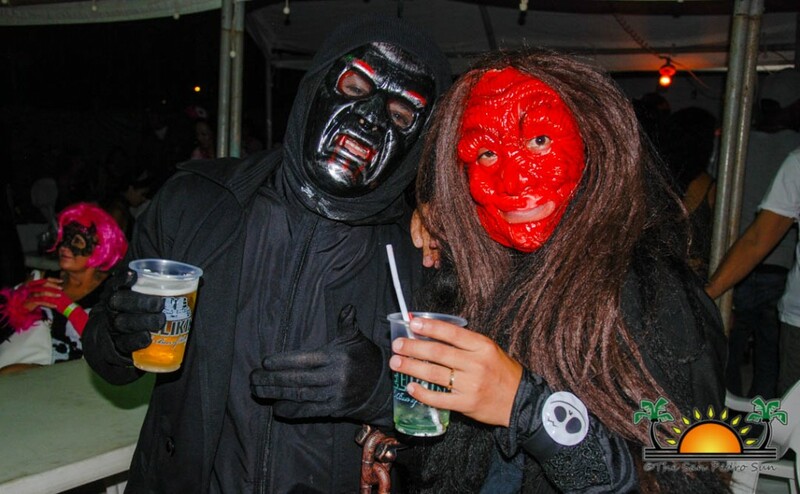 The Voodoo Doll took the Scariest costume award, which included one Green Iguana conservation project and medicinal trail tour for two persons, along with two nights’ stay with continental breakfast included and an onsite tour, courtesy of Chaa Creek Lodge. 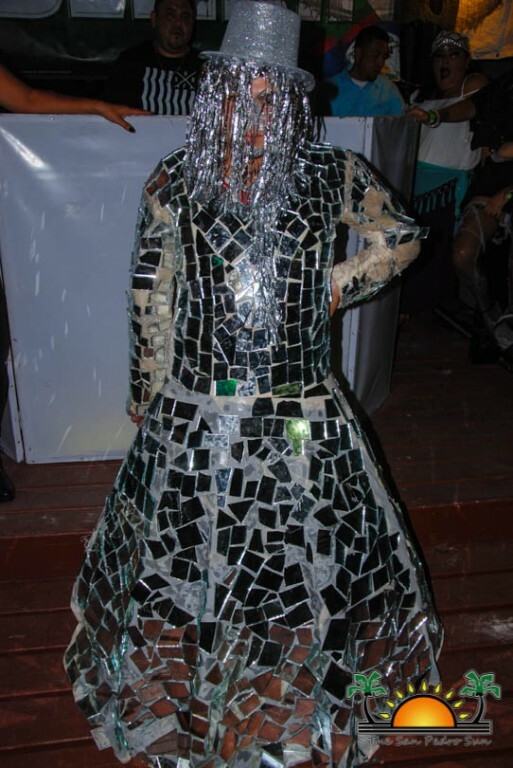 The top prize of the evening, Most Creative, was definitely a clear winner: The Mirror Lady! 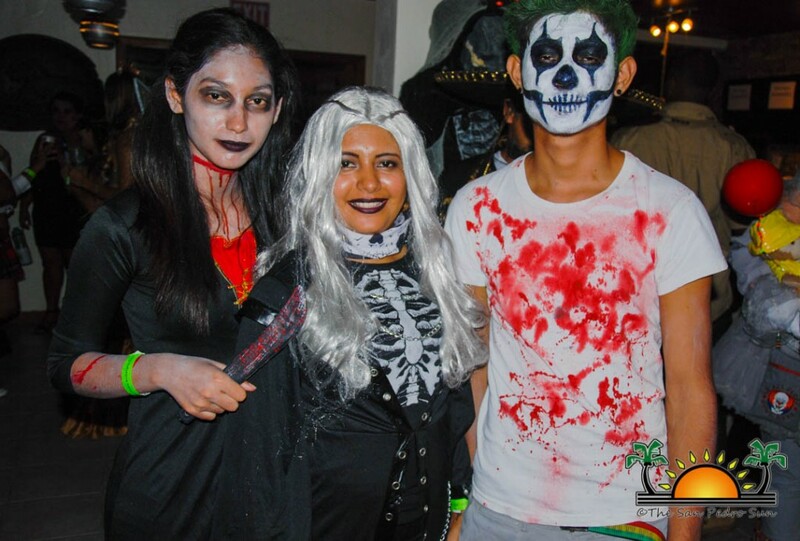 That grand prize included a $1,000 in cash courtesy of Holiday Hotel, two domestic round trip tickets courtesy of Tropic Air and two nights stay for two at Cahal Pech Village Resort in San Ignacio Town, Cayo District. 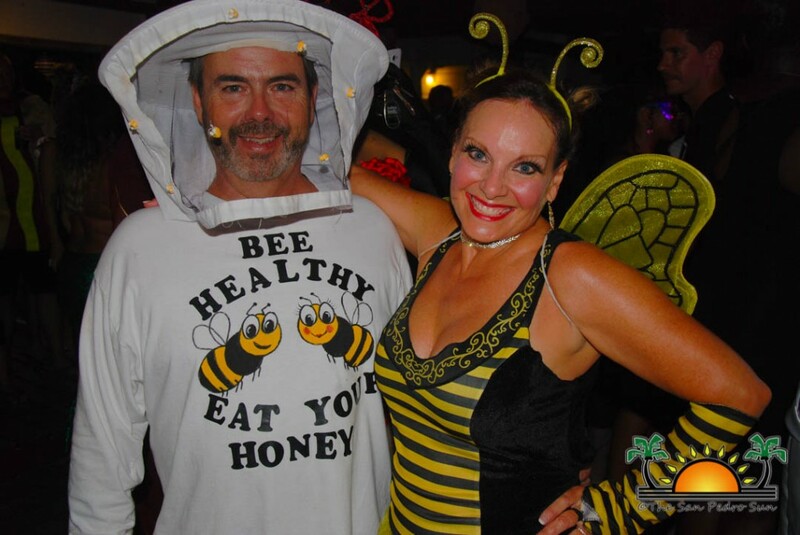 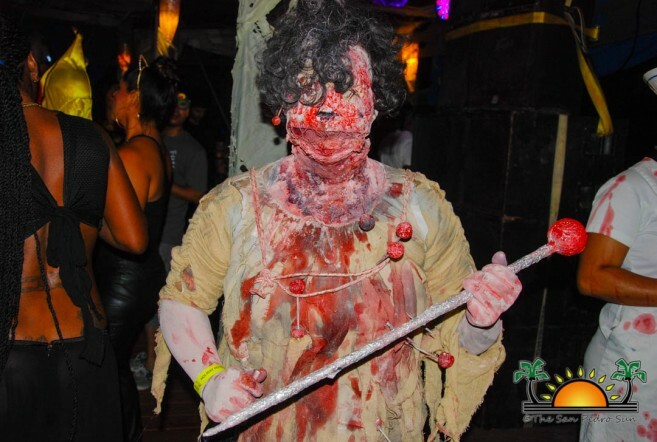 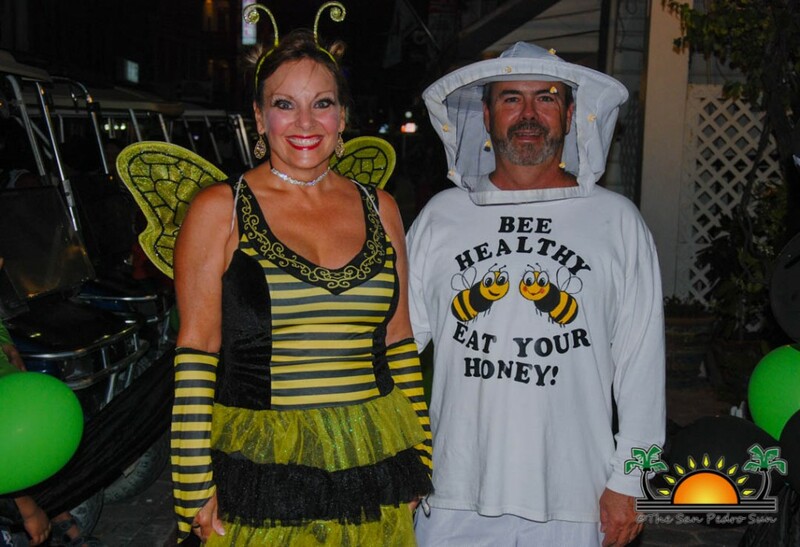 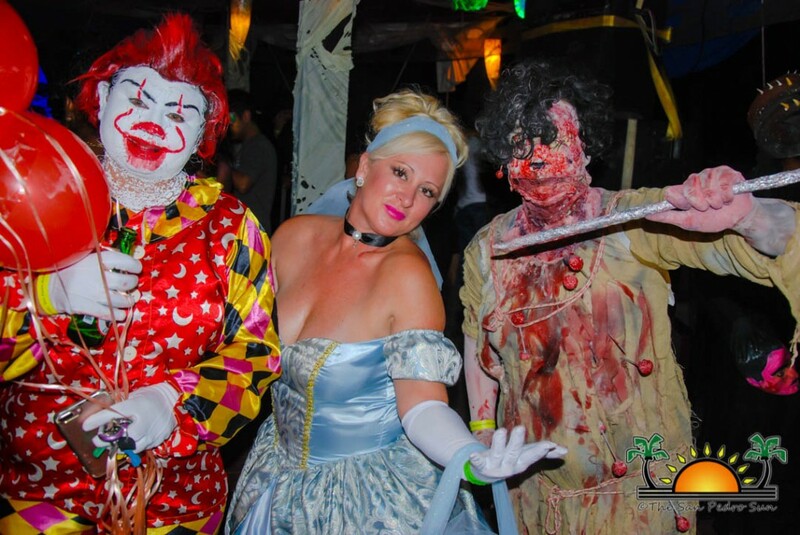 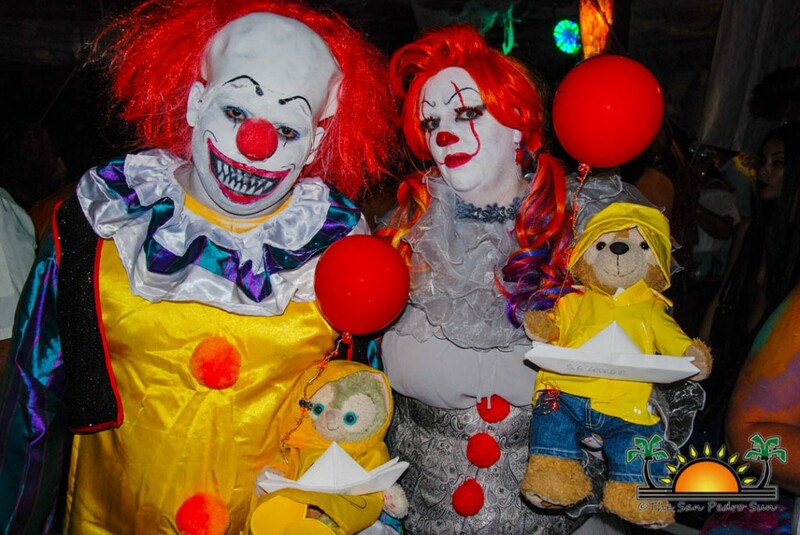 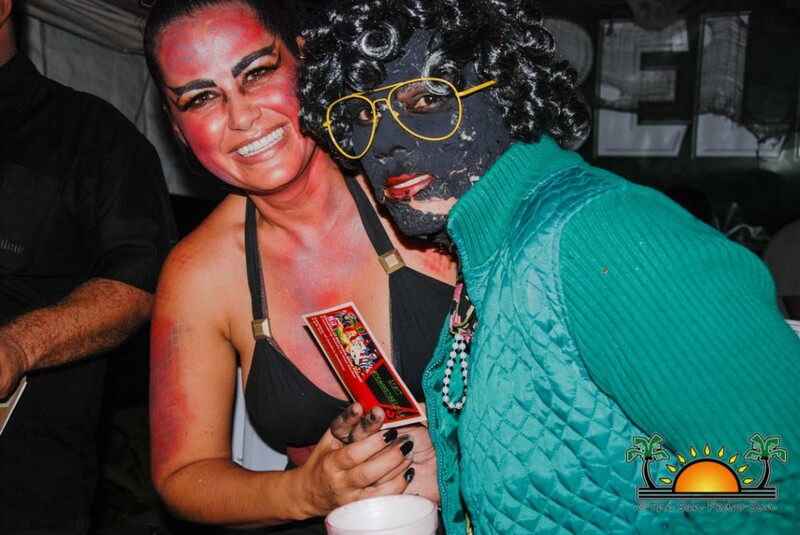 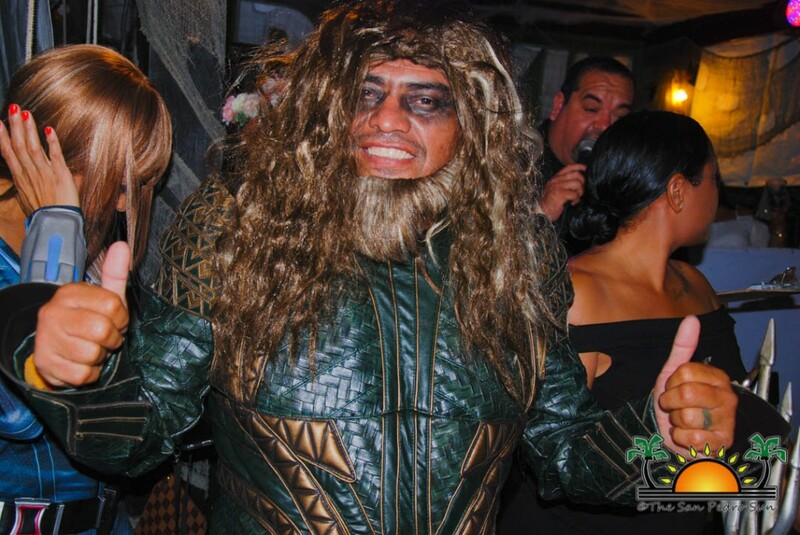 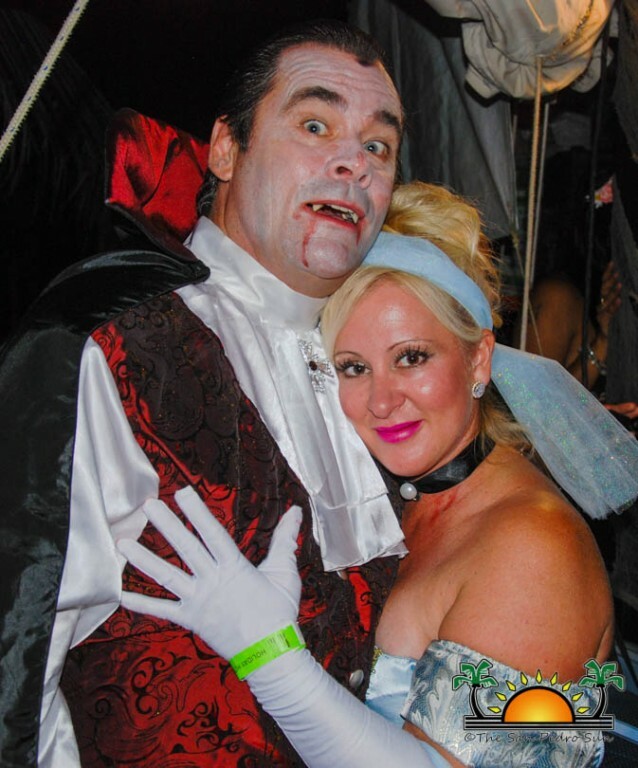 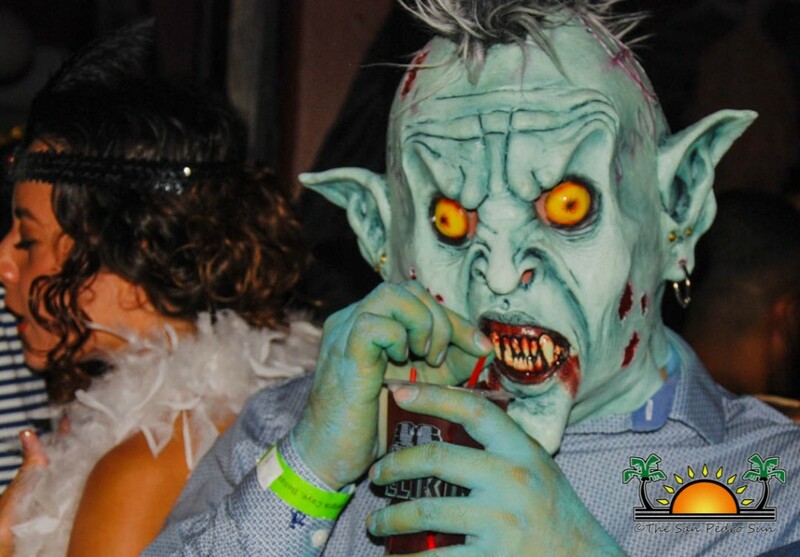 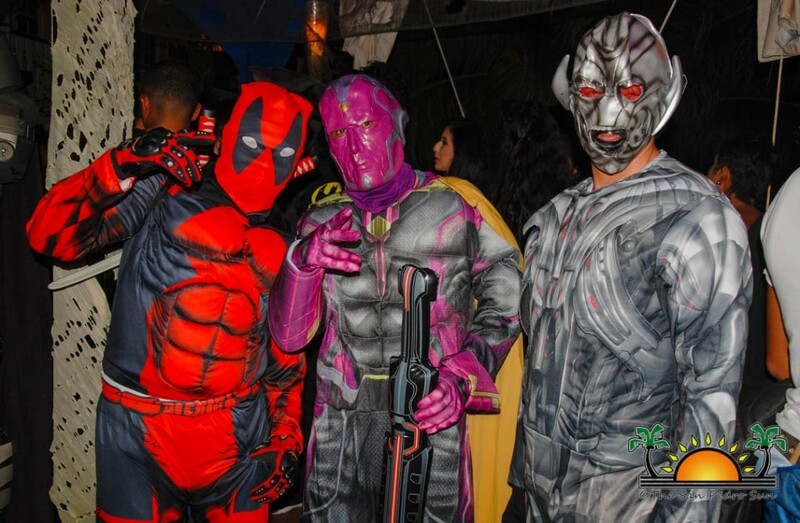 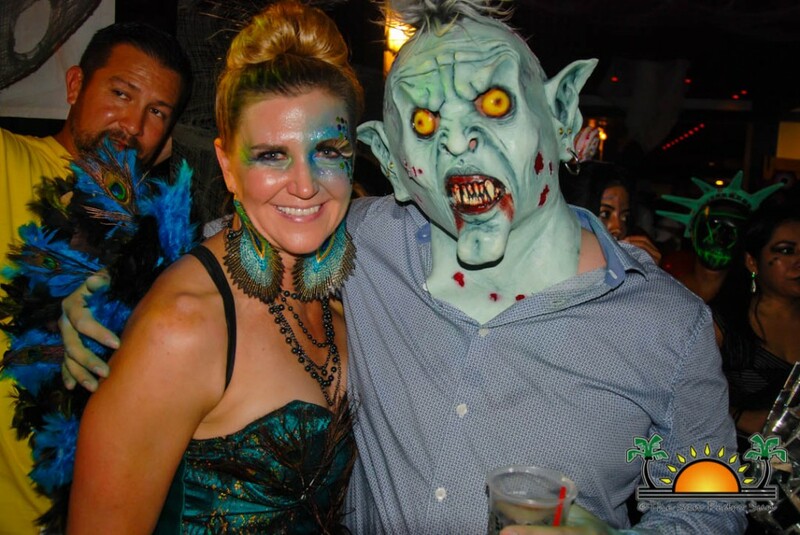 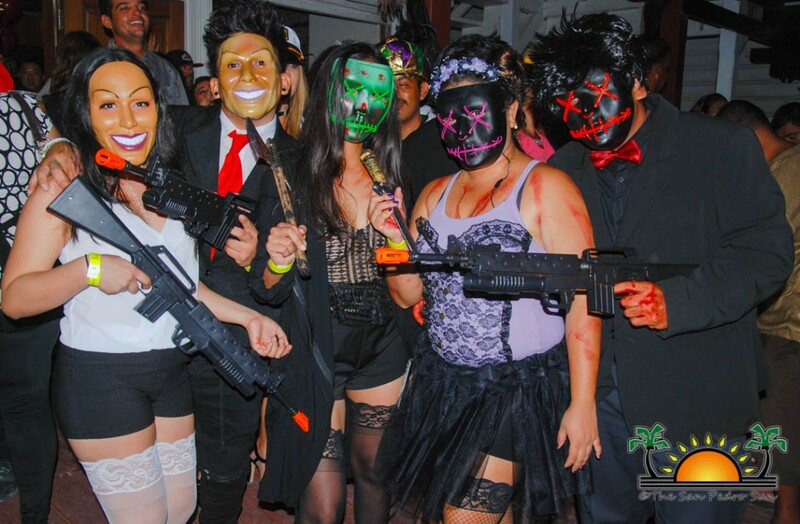 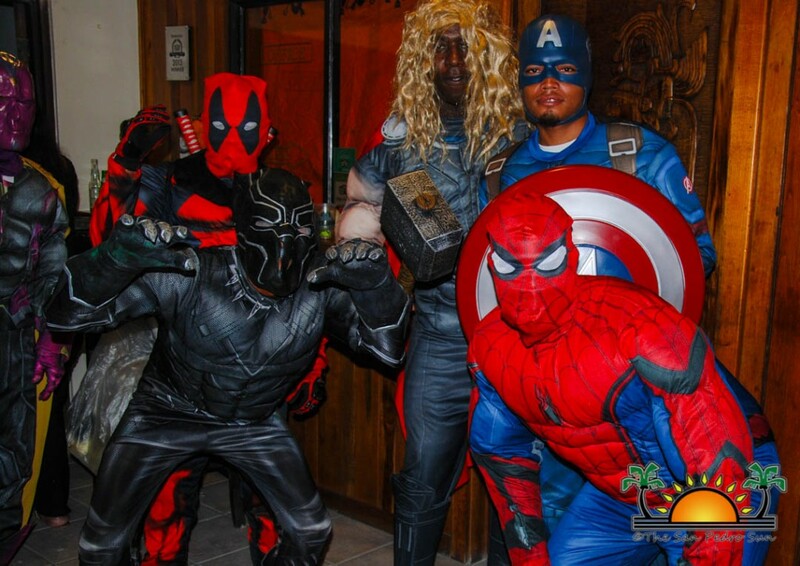 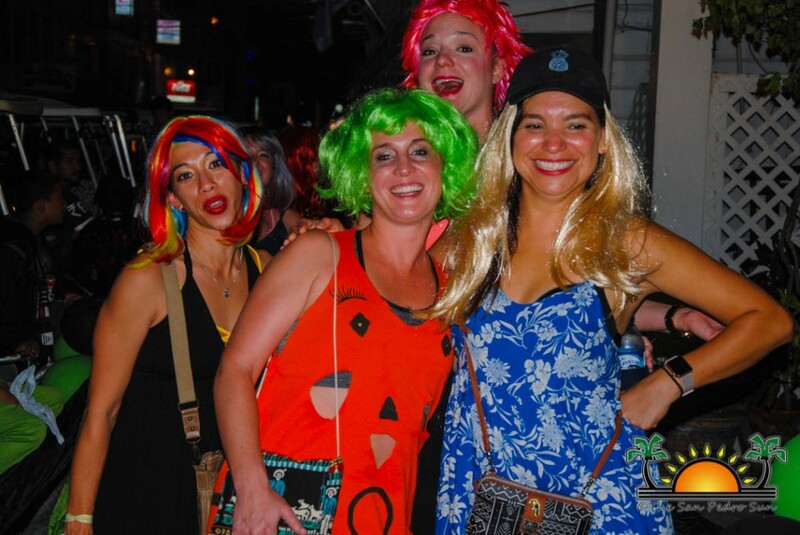 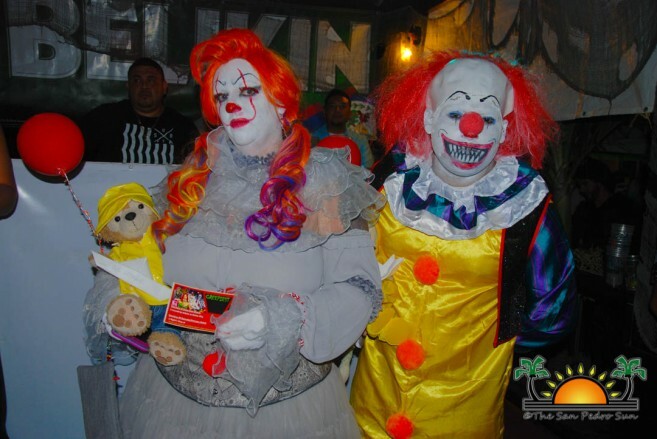 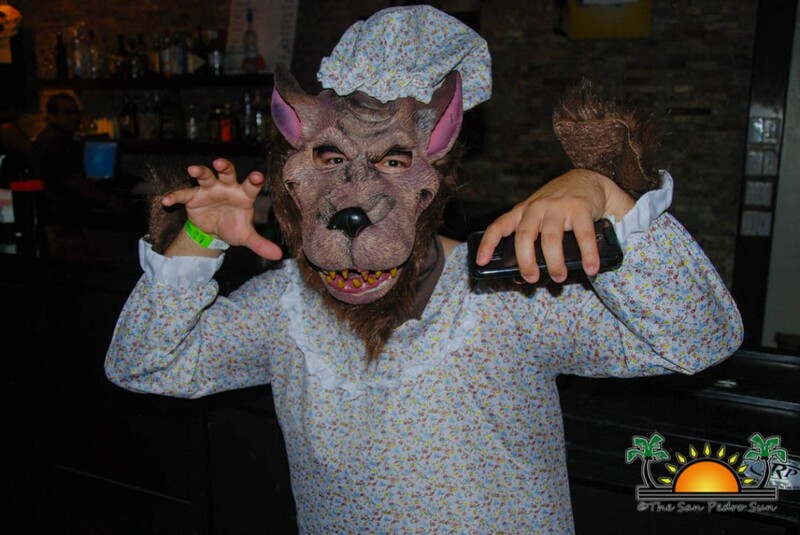 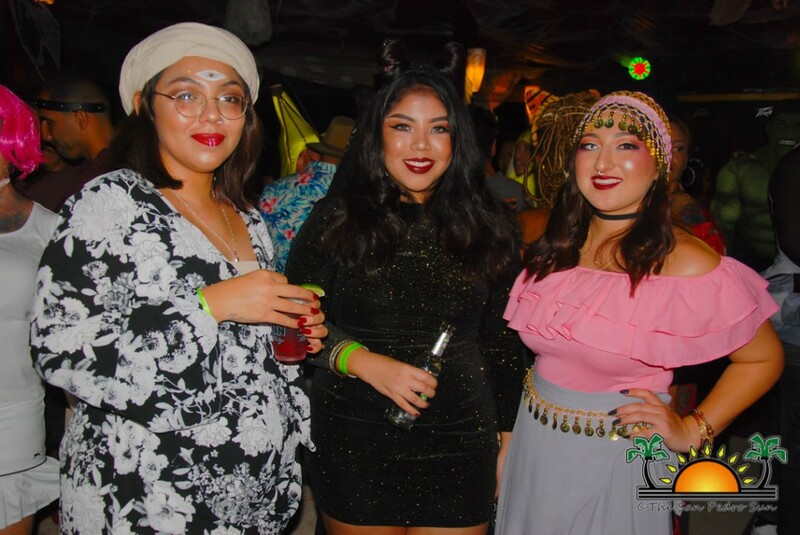 The Halloween tradition at Holiday has been on-going for the past 25 years, and The San Pedro Sun congratulates the hard-working management and staff for putting on a spectacular evening of scary good fun. 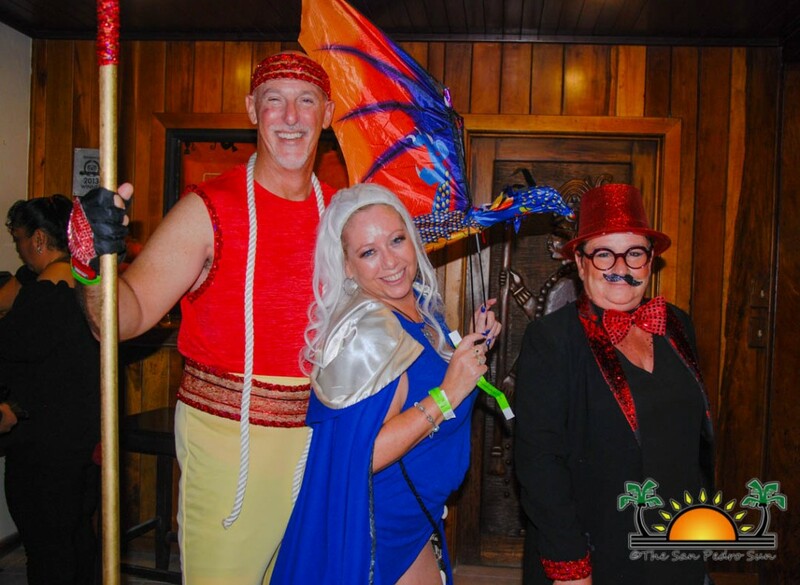 Everyone is encouraged to participate in 2018- plan to outdo this year’s spectacle! 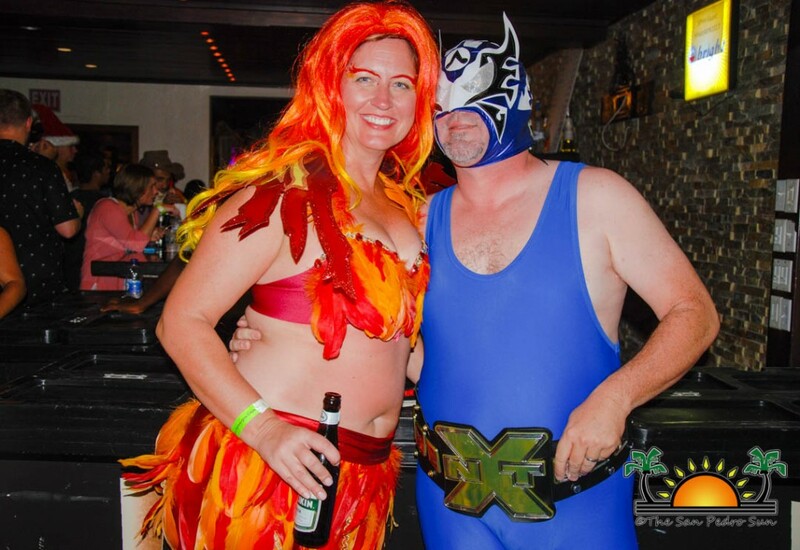 Congratulations to all the participants at the Holiday Halloween Bash 2017, and see you next year!